Not sure if you're packing your dishes in the dishwasher the right way? We partnered with Cascade for this helpful post. Every dishwasher comes with a manual showing how to load your dishes, but how many of us really take the time to look it over? And you probably already have your own habits when it comes to stacking dishes before running them through a cycle. Should silverware handles be up or down? Can you layer glasses and dishes? Here's what to take into consideration the next time you're loading the dishwasher. Position larger items at the sides of the racks, like sauté pans or platters, so they allow water flow and don't snag moving parts, like the water spray arms. Adjust racks and baskets to accommodate larger items. Never place these items at the front of your dishwasher, because they might get in the way of detergent properly dispensing. Dishwasher-safe pots and bowls should be placed top down so they get even water spray. Place any sharp items, like knives, handle up to avoid damaging your dishwasher — and keep your hands safe when unloading. A mix of handles up and down keeps forks and spoons from nesting, which can prevent them from getting clean. 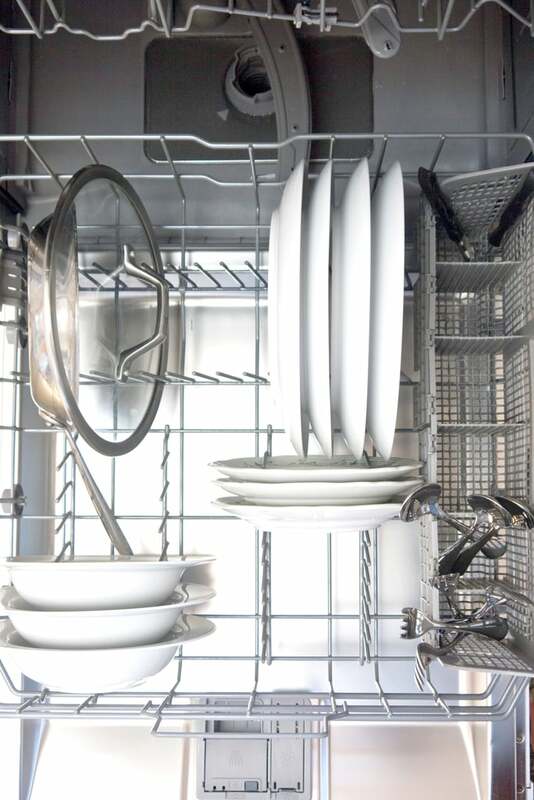 If your dishwasher has a silverware holder use it to hold and separate individual pieces of flatware. Avoid letting dishes touch. This will allow for even water and detergent distribution and will get your dishes sparkling clean. And you can alternate sizes of plates when loading so water spray can really get to dishes. Place all open items, like mugs or glasses, open side down so they get completely sprayed. Use side racks for holding wine glasses at just the right angle. Make one single layer of dishes, avoiding anything from getting in the way of water spray. Never overcrowd or you're likely to find pools of water or dishes that aren't completely clean. Position glasses and mugs between the tines and avoid letting them touch. 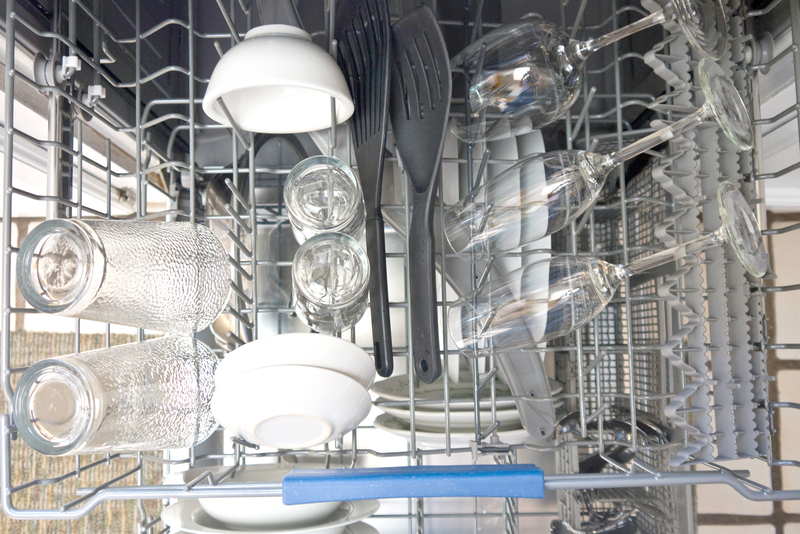 Touching can cause cracks, chips, or broken glasses due to vibrations while the dishwasher is running. All dishwasher-safe plastics belong on the top shelf, which keeps them away from the heat coil of your dishwasher. If your dishwasher doesn't have a heat coil, plastics are safe anywhere in your dishwasher, but make sure they are secure before running the load. Turn on your hot water and run the garbage disposal to make sure the drain is clear and your dishwasher starts with warm water. Check your rinse-aid levels and fill so you get even distribution. 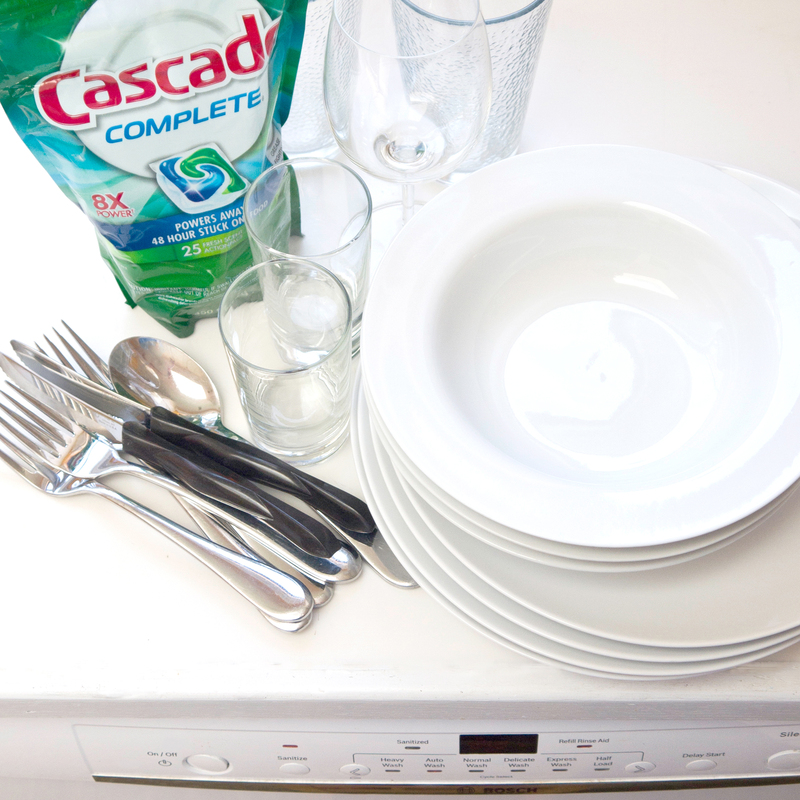 Use a cleaning pod or dishwasher detergent, never liquid dish soap for washing your dishes.